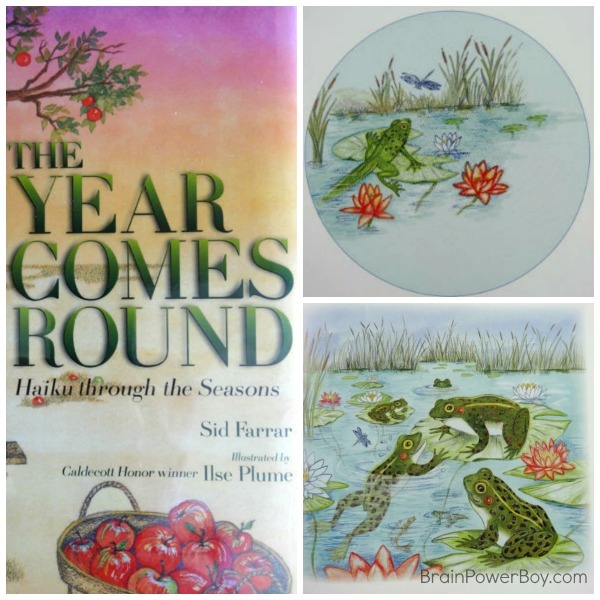 The Year Comes Round: Haiku through the Seasons, by Sid Farrar, illustrated by Ilse Plume, published by Albert Whitman & Company. As I write this we are coming out of a long, cold and hard winter. The grass is greening up and my early daffodils are starting to bloom. While I was happy to move out of winter this year, there is no denying that my family and I love the seasons. The Year Comes Round is a lovely book. We spent a lot of time slowing reading along, talking about the changes in season, thinking about what we would be seeing as spring comes into its own and enjoying the lovely pictures painted for us with haiku and the illustrations in this book. Each month is represented with haiku and an illustration that marks that month. You start in the cold of winter with January and go through the year to end once again in winter with December. The author is from Minnesota and it shows in his work. He knows the seasons as they occur here in the Midwest. I thought the best month in the book was May with the beautiful image of the frogs. Oh, we are ready to hear them croaking and peeping. What is your boy’s favorite month? At the back of the book is an explanation of Haiku, as well as a nice page on the cycle of life. Next you have information about the four seasons. The last Haiku in the book is my favorite. I would love to share it here but I don’t want to ruin the end for you! The Year Comes Round is beautiful to look at. Ilse Plume is a Caldecott Honor Book winner for The Bremen Town Musicians. Her attention to detail is what stood out for us. This is a great book for learning about the seasons through haiku and art. You and your boys may be inspired to write your own haiku or do some drawing or painting. This is a very enjoyable title and we were happy to spend a surprisingly long time reading it.